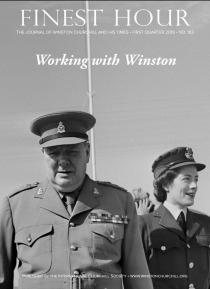 Winston Churchill was one of the greatest statesmen in world history – widely revered, sometime reviled and universally recognized for his tenacious leadership. Finest Hour, the Journal of Winston Churchill, is the flagship publication of The Churchill Centre. Each quarterly issue is packed with expert analysis and insightful discussion from prominent authors, historians, and journalists on … all aspects of Churchill’s life and times. Finest Hour dispels the myths, explores the rousing speeches, and reviews the most interesting books, all thoughtfully written, thoroughly researched, and presented by a team of experts. Your digital Finest Hour subscription also includes membership in The Churchill Centre. As part of your digital membership you receive full access to all of our premium website content, a free subscription to the monthly email newsletter of Winston Churchill, Chartwell Bulletin, discounts to Churchill sites in Britain, and invitations to special events.